This was a very hard Blog to write. Not just because the topic is a trigger for me, or upsetting, but because I am so passionate about it. Soon there will be a new form of oppression for those that are unfortunate enough to be “living” on some form of “welfare” (ahh the irony of that name for the a below minimum wage income) and it is called the ‘Healthy Welfare card’ (also known as the Forest Card). And with renewed discussions about domestic violence the government has been rather quick to capitalize on these current events to convince people that the use of this card will be beneficial to those who have suffered at the hands of a violent partner. 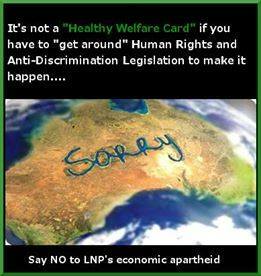 So what is this ‘healthy welfare card’ ? Well, it is an idea created in the mind of a man known as Andrew Forrest who is a billionaire in the mining industry which is meant to be a “improved” form of Basics card. He believes that by restricting access to cash and controlling where the money welfare recipients spend their money means that the level of gambling,drug and alcohol abuse will drop because they no longer have easy access to cash. Wait, did you get that? This man is NOT a politician, he was not and never has been elected as part of parliament but yet it is HIS idea that our parliamentary leaders are trying to push through. Basically this man has the ability to have his ideas forced onto society merely because he has money, that is it, because with money there is power. We live in a society with an issue that is common world wide. Those that are in the 0.1% of the actual population have a say over the rest of the population. It is their voices that are being heard above those that they are trying to silence. The ones that own substantial shares to various media outlets have full control over what we are hearing and are told to believe. You just got to look at the current movement over in the UK called Occupy Rupert Murdoch. So who do you think really benefits from the oppression of those who are going to be forced onto this degrading form of financial abuse? The limitations on what you can spend “your” money on means that you can only go to big brands stores such as Woolworths or Coles. So no more ducking down to the local markets to pick up some fresh fruit and vegetables, or buying clothes at cash only opp shops or online buy/swap/sell sites. Seems a bit suss aye? It is VERY clear that limiting access to money or controlling a persons expenditure will never, and never will, prevent or stop violence in the home. Never. It just will not happen. A abuser will, in fact, be given more control over their victims as the victims no longer have any form of financial freedom to escape the situation. How can you save up money to leave if your partner is monitoring you bank account and questioning where every cent is spent? Drug and alcohol abusers will always find away to get cash to get their next fix. Gamblers will find a way to use their cards in a different way so that they can still gamble. If you want to know more about domestic violence and how this card will really effect the real victims of this card listen to this interview on Radio Adelaide Digital. This is sadly not a new concept, controlling the masses has always been something those in power wish to achieve. But is it really for “our benefit” or is it more because they want to keep their money, and so must prevent anyone else from rising to power and gaining a chunk of their income.